OG: original Gum. Good Luck & enjoy the feast ! VAR. : Variety. OG: original Gum. NH: Never hinged. Good Luck & enjoy the feast ! VAR. : Variety. OG: original Gum. NH: Never hinged. Good Luck & enjoy the feast ! VAR. : Variety. Est: Estimate. This is a great item! OG: original Gum. Good Luck & enjoy the feast ! VAR. : Variety. Est: Estimate. A selection from various series as shown. BAHRAIN 1950, GB OVERPRINTS KGVI SET SG 71-79 MLH. BAHRAIN KGVI 1940 Issue 12 Cents Scott 31 SG31 Used Catalogue Value £50. Bahrain 1933 KGV Overprint set complete MLH. SG 1-14w. Sc 1-14. Bahrain 1933 KGV Overprint set complete mint lightly hinged. Gibbons # 1-14w. Scott # 1-14. Bahrain 1950 KGVI set complete in blocks of four superb MNH. SG 71-79. Sc 72-80. Bahrain 19 50 KGVI set complete in blocks of four superb mint never hinged. Gibbons # 71-79. Scott # 72-80. 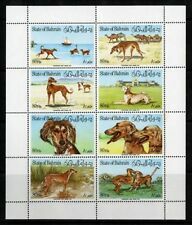 BAHRAIN 1948-49 COMPLETE SET SG 51-60a MNH. 1948-49 COMPLETE SET. FINE UNMOUNTED MINT. MLH/MM (etc) - a mix of MLH and MM with the majority being MLH. MLH - Mint Light Hinged - lightly hinged no hinge remainders. VFU - Very Fine Used. FU - Fine Used. make Supersized seem small. MNG - Mint No Gum. MNH - Mint Never Hinged. MLH/MM (etc) - a mix of MLH and MM with the majority being MLH. I have several of these sets for sale - the one you receive will be as good a quality as the one in the scan or better. BAHRAIN KGVI Scott 80 SG79 Used. Catalogue Value £22. Bahrain 1938 KGVI Overprint set complete MLH. SG 20-37. Sc 20-37. Bahrain 1938 KGVI Overprint set complete (ex Baillie) mint lightly hinged. Gibbons # 20-37. Scott # 20-37. BAHRAIN Queen Elizabeth II 1955. MINT Very Lightly Hinged - Full Original Gum. made with love by. BAHRAIN 1970 First Gulf Flight to London SG 175-177. SC 177-179. Cat £20 MNH. However, scans cannot be relied-on for exact reproduction of colours or shades. Nonetheless; we try to match real item as much as we could. BAHRAIN SG20/37 1938-41 DEFINITIVE SET(15r is WMK INVERTED).